When Nirvana burst onto the scene in 1991, the music they played spoke directly to an angry and disenfranchised generation. Grunge took over MTV and radio overnight… but just three years later, the drug-related deaths of several musicians and the suicide of Kurt Cobain closed the books on an all too brief era. Patty Schemel, the acclaimed drummer for Courtney Love's seminal rock band Hole, was in the middle of all of it. The openly gay woman who always felt different never dreamed she would be in a multi-platinum band, touring with legends… or that, thanks to drug addiction, she could lose it all. Given a video camera just before Hole's infamous Live Through This world tour, Patty filmed everything; the shows, the parties, and startlingly intimate footage of Kurt and Courtney. This footage has never been seen... until now. Directed by P. David Ebersole, Hit So Hard is a harrowing tale of overnight success, the cost of addiction, and ultimately, recovery and redemption. Featuring live and recorded music from Hole, Hit So Hard is an all-access backstage pass to the music that shaped a generation. 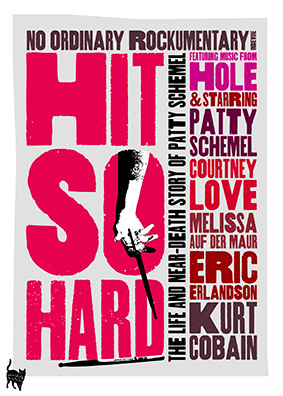 Hit So Hard will be released on UK DVD on 26th November 2012 by Peccadillo Pictures at the RRP of £15.99.